Our corporate mission is to continue to grow as a vital force in the transportation and logistics industry, and to provide superior logistical services and support to our customers. We are a winning team of capable leaders, associates and agent partners who respond quickly and efficiently to change and are able to adapt aggressively to the customer’s needs. Founded in 1939 by Albert Evans Sr in Pottsville, Pa., The Network has evolved over the last three decades from an asset heavy LTL trucking operation into the largest asset light independent Intermodal drayage provider in North America. The Company has primarily been focused on building its drayage platform through service expansion and acquisitions. As of today the network has expanded operations to include brokerage, flatbed and truckload, with 600 service center locations and more than 7000 trucks. This expansion extended into employment as well, The Company now employs 400+ people half of whom are in the Schuylkill Haven corporate office. 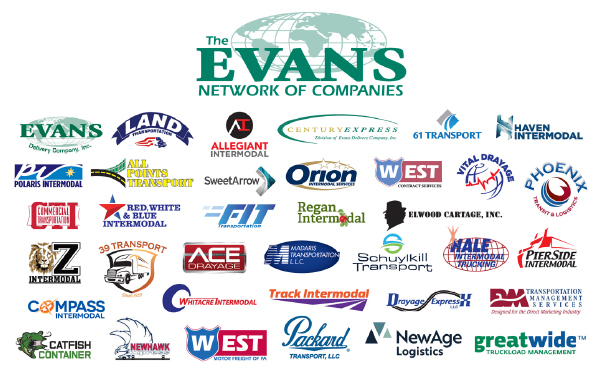 With revenues in excess of $1.2 billion, Transport Topics, a widely read transportation periodical ranks Evans Network as the 39th largest for hire trucking company in the United States. The Evans Network of Companies is excited to celebrate 80 years in business. The Evans Network of Companies gives back to the community in many ways. Multiple employees are involved in local organizations such as Penn State University Schuylkill, The Schuylkill Chamber of Commerce, NEPA Logistics/ Transportation Partnership and many nonprofit groups including The Walk In Art Center, Schuylkill YMCA, Vision, United way, Boy Scouts of America, local fire companies, and many other nonprofit organizations.